Super functional multi-use kitchenware that's a great investment for renters looking to save space. Newlyweds should definitely add this to their registry! Space is one of the biggest concerns for renters. Fitting pots, pans, and mounds of tupperware into a cramped kitchen can be a huge pain. Which is why I was thrilled when the folks over at Foldtuk sent me a sample from their bakeware line. Let me start off by telling you what Foldtuk Bakeware is. It's amazing. That is it. Foldtuk is a tupperware/bakewear combo that folds flat for storage. 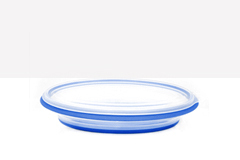 Made of Ceramber, it supposedly heats and cools faster than silicone and can be used in the oven, microwave, dishwasher, fridge, and even the freezer. To test these claims, I used my Foldtuk in each situation. First, I baked a loaf of apple cinnamon bread. I didn't use any cooking spray since the Foldtuk claims to be non-stick. The loaf cooked evenly and didn't have any weird plastic taste like I thought it would. As you can see from the pictures, a little of the loaf stuck to the bottom, but I can't tell if it's from not using cooking spray or because I've never baked a loaf before and I had no clue how to get it out of the bakeware. Considering my past experiences with cookware, I'm guessing I'm the one at fault! With normal pans, you have to do a little scrubbing to completely remove all food residue. We did no scrubbing whatsoever. We simply stuck the Foldtuk in the dishwasher and it came out looking like new! With the oven and dishwasher out of the way, my next test was the microwave. I got out my packet of instant mashed potatoes and got to work. I'm sure most of you are cringing at the thought of instant potatoes but you'd be cringing even more if you tasted my cooking. I'm horrible! Thankfully the Foldtuk was wonderful and did a great job of cooking our instant mashed goodness...just look at the steam coming from the container! The last test was the freezer. I forgot to take pics of this one...sorry! Long story short, I froze some steak tips for a few days. 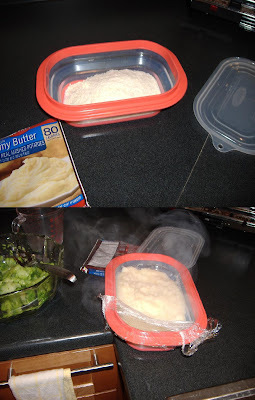 There was a little freezer burn which leads me to believe the container wasn't closed properly since my tupperware test proved it is air-tight. Still, the food thawed out quickly in the fridge and the meal turned out well. To test it's food storage abilities, I filled my Foldtuk with water, then tossed it, turned it, even dropped it on the floor. Not a single drop of water came out. Not only is the helpful around the kitchen, but it's great for packing a lunch. Finally, I don't have to worry about spilling salad dressing in my purse! While the Foldtuk is great at cooking and freezing, its storage abilities are the most impressive. We've been putting off purchasing a Pyrex cooking set for months now, simply because we have no room to store all the pieces. The Foldtuk takes care of that by collapsing into a slim 1 inch height. Fold it down, snap on the lid, and your storage problem is solved. The only downfall to me is the Foldtuk's price. The 6-cup rectangular container retails for $21.99. For a thrifty gal like me, $21 seems outrageous. However, when you take into account all of the Foldtuk's functions and the fact that you can store it anywhere, $21 seems like nothing! You can also buy the Foldtuk in other shapes (square, circle, and rectangle), colors (orange, red, black, and blue), and sizes (4 or 6 cup). On top of that, there's also a Foldtuk roaster so you can cook easily cook and serve a big meal all in one collapsible container. Apparently, there's also Foldtuk cookware in the works. Collapsible pots and pans? I'm SO there! Sounds wonderful. And living in a NY apartment i know i can use all the space i can get! But still... i love the look of my vintage pyrex! I agree...nothing beats a good vintage set. Still, it's great for small kitchens. I'd probably do a mix of both! Which reminds me, I'm stopping by your Etsy shop today to take another look at those dishes! 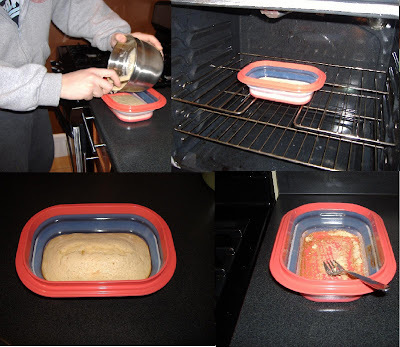 It's a multipurpose bakeware. I think that we can use it in many ways.